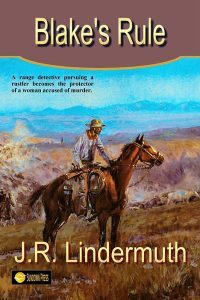 When the local sheriff, James Fremont, asks Blake to spirit Miriam and her two children out of town before a lynch mob comes for her, he agrees. But Cyrus Diebler, the influential rancher who is intent on seeing her pay for her crime, is not about to be stopped. He will go to whatever lengths he must to see her dead, though it means putting his own family in harm’s way. As Blake and Miriam stay one step ahead of the relentless Diebler and his deadly henchmen, a relationship begins to build between them. When Blake learns the real story behind the murder, and the dark secrets of Diebler’s motivation to see Miriam dead, he vows he will protect her and her children at all costs—even if it means his own life.